Going Harder And Going Smarter | Mediterra - Swim & Run Better Than Ever! 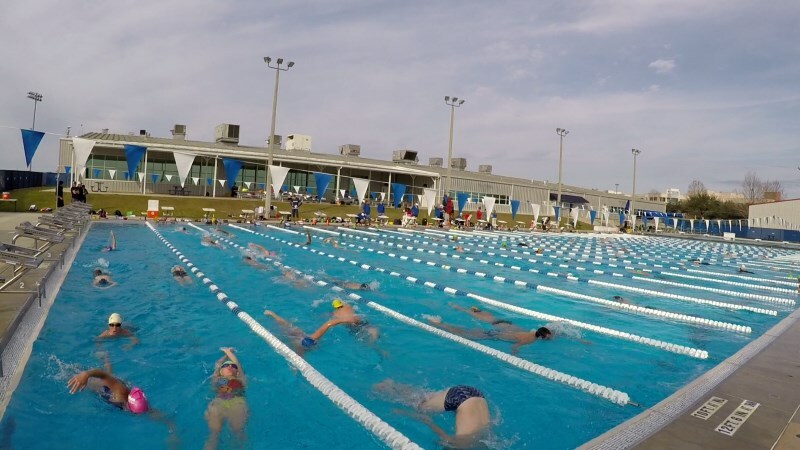 I have a couple swimmers in one of our weekly practice groups who are members of a local masters swim group that meets on a two different evenings each week. They came to me some months ago because their coach is great at making them work hard, and work harder, in nearly every practice, but he has done virtually nothing to improve anyone’s technique on the whole squad. These two swimmers value the social element and the opportunity to be pushed hard each week, but they have realized that technical changes were needed for them to rise above their current abilities. Constantly pushing the aerobic and muscular system was not taking them any farther. Now that we’ve been working together for about three months – they took a little time away from their masters workouts and have now resumed – it comes up in our conversations how difficult it is to take the new and still fragile improvements in motor control and have those stand up in the constant high intensity of those masters practices. They are caught between wanting the benefits of both the improved technical precision and the high intensity workout. What occurred to me is that these two swimmers actually have a useful scenario in those high intensity workouts. When the assignment is to go hard through a series of repeats, the swimmer is working at the edge of her strength and can feel fatigue building, threatening to shut her down before the end of the set. Under this kind of stress, in what I call the Scarce Energy Zone, the swimmer is under pressure to find a way to hold on and finish the set and maintain her dignity among the squad. To hold on, she must preserve speed to make the send-off times. But energy is dwindling. Muscles are burning and getting sluggish, less precise. The harder she swims the worse her stroke gets. What should she do? #1 appears to be the only solution that coach and this typical kind of group have at their disposal to solve the problem. And that is what the go-hard culture values: go hard, and then go harder, at higher and higher cost. But she realizes she can’t go any harder, without a cost in injury and longer recovery her older body is no longer willing to pay. There is only the other two solutions available – which require her to find a way to go smarter. That culture’s workout pressure actually provides great incentive – desperation! – for her to find ways, in the midst of fatigue, to reduce drag, to plug leaks. What’s likely happening is that as she fatigues, drag is increasing because her movements are less careful, less precise. Power leaks are increasing because individual body parts start moving out of tight synchronization, when weaker members succumb to neural and then muscular fatigue before stronger members do. And, this is the moment in the set where the opportunity for deeper efficiency training begins – the one who recognizes what is happening and accesses these two neural solutions is able to take this path to develop greater efficiency. The others who only recognize #1 miss it. This is the silver lining in the monolithic go-hard-go-harder workout environment, for those who’ve invested in acquiring the understanding for solution #2 and #3. The swimmer who has been equipped with an intimate understanding of how balance, streamline and synchronization work to create economical speed, can call up that knowledge and scan her movements to find where her stroke control is breaking down and allowing power and speed to fail more quickly than it needs to. Although there are these two extremes out there – programs that go hard but teach you little about technical excellence, and programs that may teach better technique but never challenge you with increasingly more difficult sets – you don’t have to be a passive victims to the deficiencies of either one. You need elements of both – fitness (able to go harder) and technique (able to do it smarter) – blended, and developed together. If you find yourself in a workout group that seem to go too hard without concern for technical excellence, but you don’t want to let go of the benefits you get from it, don’t give up on it (yet). You may be able to alter your perspective and draw from your technical training to find better ways to do the work assigned in those sessions. Not only will you discover ways to keep up, you may become one of the few who actually keeps improving her times. Actually, for the “victims” of the Swim Hard Only coach, the 3 choices are still available, but the coach won’t necessarily know you are making these choices unless you specifically tell the coach. On deciding to go with solution #2 or #3, the net result will still be better speed than not trying really hard, and, hopefully, even better speed than solution #1 (trying all out physically but suffering deterioration in technique) especially towards the end of the set. And when you finish each set with minimal deterioration and reasonable form despite fatigue, and therefore reasonable times despite fatigue, all coach will see is the (relatively) consistent time, which will be good enough for him. What he doesn’t know or see won’t hurt him. Hi Sclim. Yes, I think I have meant what you said – it would not be obvious to an outside observer which solution the swimmer was trying to apply. All three are internal intentions. Certainly, the coach should be pleased with the consistent time for all the repeats, however the swimmer was able to achieve it. It’s just a bit sad when the coach does nothing more than just assign tough sets without helping the swimmers figure out better ways of solving them, like a teacher handing out quizzes but never actually teaching on the topic that is being quizzed, never pointing them to a text book, just hoping the students get smarter by taking quizzes. So if you are already in the situation where you need to finish but struggling, what do you suggest? Try to stay calm and try to maintain good form (or try to correct your worsening form) ? Normally for me it’s due to feeling of out of breath, even if I already shortened my breathing frequency to every 2 strokes. Is there any way you can gain just a bit of additional boost of energy, just to be able to finish ? In the midst of a really physically difficult set, the brain has a hard time thinking. You may have a list of things you know you should apply to make it easier for you, but you can’t quite see that list or decide which one to focus on. When you are really pushed like this, you can’t focus on very much. So just pick one thing from your list that you believe will help reduce drag in one way, to save a few drops of energy. And stay focused on just that. ALthough, that focal point will save you just a few drops of energy on each stroke, those drops add up. And if you apply this same focal point over several practices, it eventually becomes a habit and then your brain is free to pick a new focal point and make another habit of energy saving under high stress swimming. When at the end of a race or a tough swim and we feel we cannot go any harder, one focus that really helps is to emphasize “Send Force Forward” rather than putting emphasis on “Pull water backward”. Don’ try to pull/push harder, keep your best focus and effort on how well you are forming your recovery and sending your force into the water and sending your body forward on each entry and extension toward your target. Come to your best Skate position on every stroke, no matter how tired you get. If you can’t do everything, do just this one thing with what you have left.